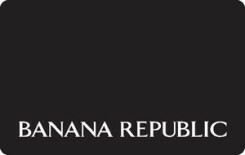 Earn 7.5 SB per $ when you buy Banana Republic gift cards at MyGiftCardsPlus. Exceptional quality, luxurious fabrics and refined tailoring define Banana Republic's signature style. From work to casual occasions, Banana Republic offers covetable, uncomplicated style. For the nearest store call 1-888-BR-STYLE or visit us online at bananarepublic.com. This eGift Card is issued by Direct Consumer Services, LLC, a California limited liability company, and may be redeemed for merchandise at any Gap brand, Old Navy, Banana Republic or Athleta location, including Outlet and Factory stores.